Find and compare the best prices from a range of well known car rental companies at Vilnius Airport. This is a free to use facility, enabeling you to book direct with the company quoting the price. Vilnius airport has one passenger terminal which was modernised in 2007, enabling Schengen and non-Schengen passenger flow to be separated. A train service runs between the airport and Vilnius during the daytime with a journey time of 7 minutes and cost of 1 Euro, the airport station being approximately 300m from the terminal building, accessed via a covered walkway. A bus service is also avilable into Vilnius at a cost of 1 Euro. Taxis are available and a trip into Vilnius old town should cost around 10 Euros. Vilnius airport has 11 cafes/bars, 14 shops, currency exchange, 2 cash machines, 2 VIP lounges, 2 business lounges and FREE WiFi Internet access. The 115 roomed AirInn Hotel is located approximately 100m from the terminal building. 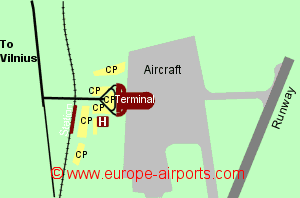 Vilnius airport has Airport Carbon Accreditation, at the Mapping level. 3.7 million passengers made use of Vilnius airport in 2017, a 1% decrease compared to the previous year.